As in the qualia pavilions, down by the beach, one thing leads to another and one place opens onto another. Outside the Pebble Beach Restaurant, where we’ve just enjoyed our first qualia culinary adventure, a path leads to a huge beach-side infinity swimming pool, surrounded by deck-chairs and little trellis cabanas. 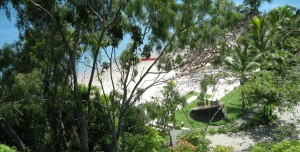 The pool garden opens onto the beach. Commodious, deck chairs are drawn up at the water’s edge, with an uninterrupted vista across the water – perfect. We settle in to watch the Whitsunday world float by. A waitress in shorts and sandshoes delivers coffees and a s soon as the cups inch down to empty she arrives to remove them. Minutes later she reappears with complementary bottled water. On the sea, the current carries logs from far out on the reef, fish jump. Kayakers paddle past. An occasional snorkel, propelled by a half hearted kick, bobs by. A yacht follows, with life-jacketed sailors leaning out to starboard. They’re blocking the view, they’re spoiling the silence. I wish them away. I close my eyes and in minutes they’ve vanished round the bend. I brave the sea for a cooling dip. The coral is cruel on my bare, soft city feet. Note to self and others – be sure to bring the reef shoes!. The water is heavenly I float face down, lost in a landscape of ridges and ravines, schools of tiny fish dart around the forest of coral. I float face up, lost in the infinite blue. The shadows lengthen, the sky turns pink then pales. 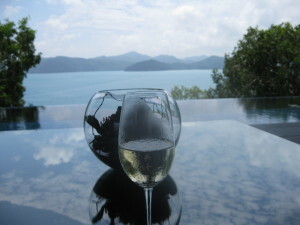 It’s time for another qualia experience – the gym! “the qualia experience would not be complete without a culinary adventure through the finest produce our region and country has to offer”. We begin our culinary adventure with lunch at the Pebble Beach Restaurant which sits just on the edge of the beach below our pavilion. Our table on the deck looks out over the sea to bushy bays on a distant shore and the waves lap softly at the stones below. The menu is a great read and it’s sensibly short. Those seeking awakenings of the sensory imaginations, especially in three days, don’t really have time to linger. Still we dither. Beside us a gentleman is tackling a large colourful burger while his partner tucks into a work of art in fruits de mer which the waitress confides in a whisper is the black kingfish and salmon nori tempura with green apple, cucumber, wasabi, sweet ginger dressing. We decide finally to divide and conquer, mounting a united assault on the entree of ribboned foie gras, chocolate paper and pear purée served with toasted brioche. We divide for the main. He takes the lead from his neighbour and orders the char grilled beef burger with fries, bacon, gruyere, caramelised onions, lettuce, and tomato while I wade into unknown waters for the alt ‘n’ pepper bugs with bean sprouts, Asian herbs and hot ‘n’ sour sauce. Together we conquer dessert – vanilla panna cotta with espresso jelly and hazelnut biscotti. A wonderful beginning to our culinary adventures at qualia! After only half a day, my jaded sensory imagination is already beginning to revive!